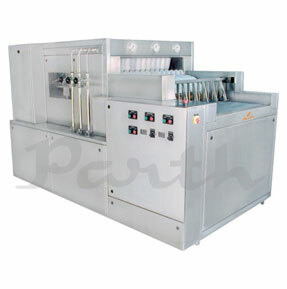 High Speed Linear Bottle Washing Machine is most ideal for Round and Flat Bottles and finds wide application in PHARMA, FOOD & BEVERAGES INDUSTRIES. The automatic loading arrangement facilities loading of bottles on to SS wire mesh conveyor through feed conveyor or bottles are pushed manually from feed table. This round bottle washing machine or flat bottle washing machine saves manpower as bottles are feed into pockets automatically. The automatic unloading mechanism consists of unloading bottle continues on to Turn Table (Optional). High-pressure pump ensure proper wash of bottle. Suitable for Round and Flat Glass Bottle (with help of change parts).